Skinner to Host Fine Musical Instruments Auction on May 22 | Skinner Inc.
BOSTON, MA – May 10, 2016 – Skinner, Inc. will present its first Fine Musical Instruments auction of 2016 in its Boston Gallery on Sunday, May 22 at noon. This auction will feature 250 lots, including a selection of antique and vintage fretted instruments, several historically significant wind instruments, and a wide variety of classical stringed instruments and bows. Leading a selection of antique and vintage mandolins, banjos and guitars is a fine Classical Guitar by Robert Bouchet (Lot 26, estimated between $40,000 and $60,000), from the estate of noted Mexican classical guitarist Mario Beltrán del Río. One of roughly 150 instruments completed by Bouchet, this late example presents a rare opportunity to the professional player and collector alike to acquire an exquisite icon of the luthier’s craft. Also on offer is a rare and desirable 1941 C.F. 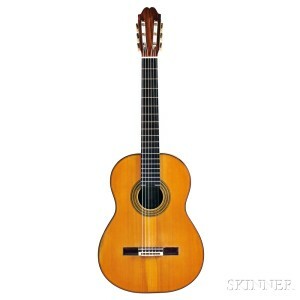 Martin & Co. D-45 guitar (Lot 23, $30,000-$40,000). Sure to excite is the homecoming of two historic silver wind instruments by two of Boston’s premiere makers. 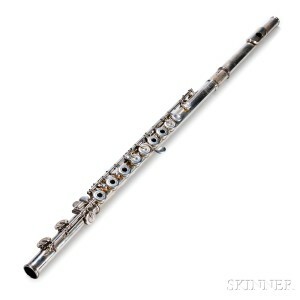 The first, American Silver Flute #201 by Verne Q. Powell, Boston, 1933 (Lot 37, $8,000-$12,000), was owned by William Morris “Monty” Kincaid, considered the Grandfather of the American Flute School. In 1939 Kincaid, who favored Powell instruments, also purchased a platinum example (#365) which had been made for display at the New York World’s Fair; that instrument sold at auction for $187,000 in 1989. An American Keyed Bugle by Henry Sibley, Boston, 1840 (Lot 38, $12,000-$16,000) has even closer ties to the New England. Engraved “Edward Kendall” on the bell, it was owned by bandleader Edward “Ned” Kendall. The leader of the Boston Brass Band, Kendall was considered one of the virtuosos of this short-lived antecedent to the valved cornet; his well-documented 1856 “duel” with cornetist and band leader Patrick Gilmore of Salem, MA was both one of the highlights of Kendall’s career and a turning point for musicians away from the bugle and toward the less complex cornet. Highlights in an offering of exceptional stringed instruments are a Dutch Violin by Pieter Rombouts, Amsterdam, c. 1712 (Lot 91, $10,000-$15,000); a French viola by Charles Gand, Paris, 1843 (Lot 80, $18,000-$28,000); and a Violoncello by Gabriel Lembock, Vienna, 1846 (Lot 47, $30,000-$50,000). Not to be outdone by its co-stars is The Red Violin (Lot 100, $3,000-$4,000), one of four surviving screen-used hero props from the 1998 film. 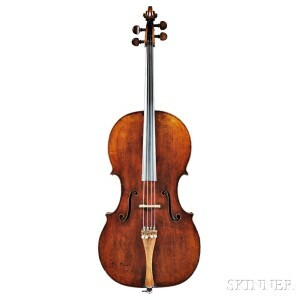 Skinner is also pleased to offer an exquisite Violin Case by W.E. Hill & Sons, London, c. 1887 (Lot 53, $6,000-$8,000), as well as a collection of fine bows by renowned makers Tubbs, Sartory, Lamy and Fetique, among others. Please join Skinner on Friday, May 20 at 6PM for a Classical Salon featuring The Yaeko Miranda Elmaleh Group. This event is free and open to the public, and refreshments will be served, but space is limited. Please RSVP to events@skinnerinc.com. Previews will be held on Friday, May 20, from 12PM to 7PM; Saturday, May 21, from 10:30AM to 5PM; and Sunday, May 22, from 9AM to 11AM. Illustrated catalog #2892B is available from the Subscription Department, at 508-970-3240, or from the Gallery. Prices realized will be available online, at www.skinnerinc.com, both during and after the sale. The Skinner website enables users to view every lot in the auctions, leave bids, order catalogs and bid live, in real-time, through SkinnerLive! This entry was posted in News and tagged 18th century, 19th century, 20th century, American keyed bugle, auction, Austrian Violoncello, banjo, bassoon, boston, c.f. martin, cello, craft, fender, Fine Musical Instruments music, flute, french bow, French guitar, French violoncello, Gabriel Lembock, Genuzio Carletti, gibson, Gibson Les paul, Giorgio Gatti, guitar, harmonica, Italian violin, Justin Derazey, luthier, musical instruments, Paris, Paul Blanchard, piccolo, Piero Parravicini, Pieter Rombouts, pochette, rare flute, rare guitar, Robert Bouchet, skinner, Spanish guitar, stringed instruments, The Red Violin, Verne Q. Powell, vienna, vintage guitar, viola, violin, violin bow, violin case, violoncello by Skinner. Bookmark the permalink. ← Cats! Millions of Cats!